The Times of London has reported that The Lawyer, the leading legal industry trade publication, may be sold. In a scoop written by technology, media, and telecoms correspondent Ben Woods, the Sunday edition of The Times says that Centaur Media, the owner of The Lawyer, is hoping to raise £45 million from the sale. The Lawyer is described in the article as the “jewel in the crown” of Centaur, which is a large business publishing group with numerous titles including The Engineer, Marketing Week, and Money Marketing. The Lawyer, which was founded in 1987, and has been edited since 2000 by Catrin Griffiths, was in the early days best known for its weekly magazine, but a decline in traditional page advertising led to it embrace a broader and more digital-focused identity in recent years. 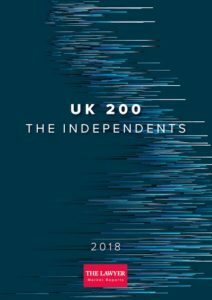 As well as news and features, The Lawyer now publishes a raft of surveys, market intelligence, and research reports (pictured, for example), plus well-known annual lists like the UK’s top 200 law firms. Current Centaur chief executive Andria Vidler took over in 2013 after a rocky period following the financial crisis when profits took a hit, and has succeeded in reviving the fortunes of the company. Share the post "Reports Say Centaur May Sell The Lawyer"